Chronographs hold a special place for those of us who are fascinated with horological achievements. The mechanism is functional and yet beautiful. And many brands these days have created their own chronograph movements, a far cry from a decade ago when one or two movements ruled the roost. 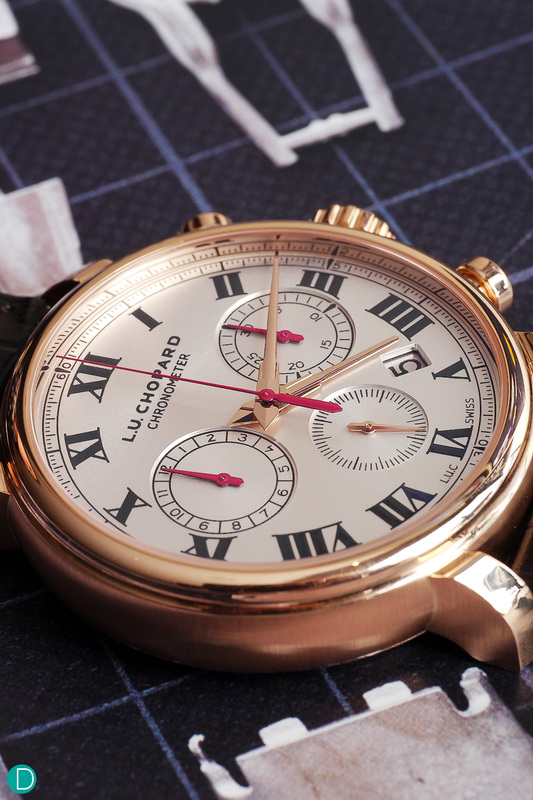 The Chopard LUC 1963 Chronograph. Hand wound, flyback chronograph. The Chopard Manufacture was acquired by the Scheufele family in 1963, and for the best part of the last decade, have been painstakingly built by President Karl-Friedrich Scheufele as a true manufacture, decided to celebrate 50 years of the acquisition by the presentation of a handwound chronograph made in the tradition of Chopard watches in the 1960s. The movement Caliber LUC 03-07-L is magnificently designed with beautiful curves featuring sharp inward and outward points. These are hallmarks of virtuoso watchmaking, as these sharp points can only be made by skilled hands, and never by machines. As can be seen, the beautifully shaped bridges are in German Silver, and show the warm hue in contrast to the steel chronograph works. Notable also is the concave rear bezel, showcasing the movement like a picture frame. 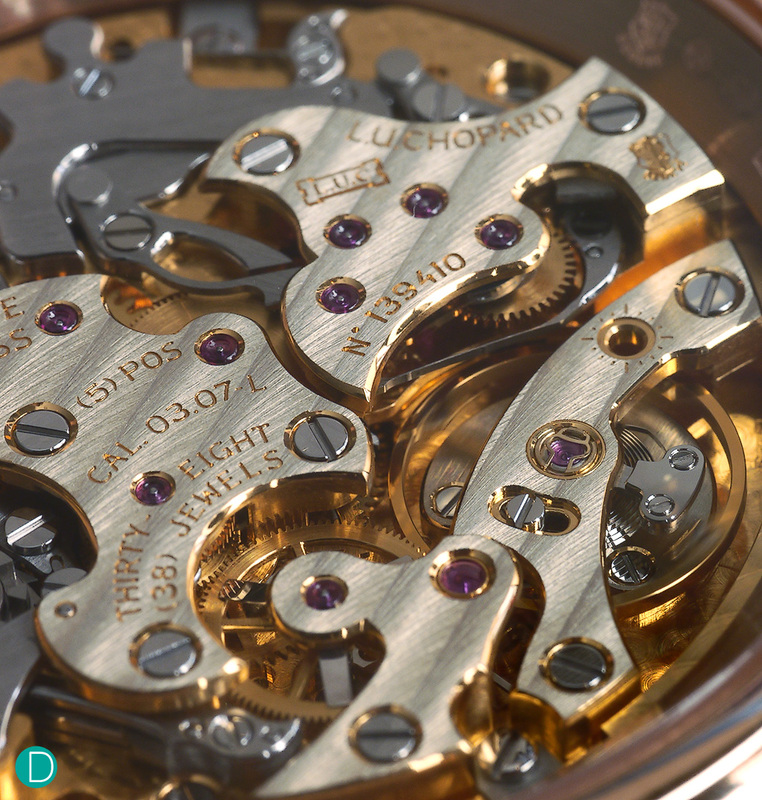 The movement is particularly interesting.The L.U.C Calibre 03-07-: is a simpler version of Chopard’s earlier inhouse chronograph movement in many ways, and yet more complicated in others. For one, the new movement is simplified because it lacks a self winding module. And yet it is designed with a flyback chronograph, with column wheel and vertical clutch mechanism, and features a zero reset for the continuous second hand when the crown is pulled for ease of accurate time setting. 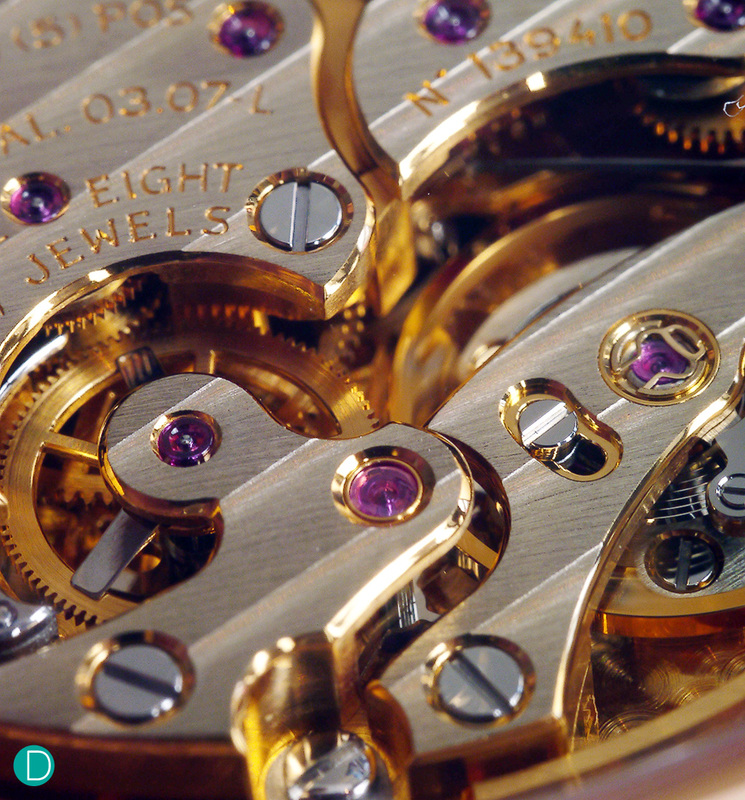 Detail of the movement, showing the German Silver bridges executed with complex shapes. Note the beautiful anglage which is highly polished and catches the light, gleaming. Note also the countersinks for the polished screws are also polished to a high shine, indicative of the high level of finishing. The movement layout is very beautiful. We particularly like the shape of the movement plates and bridges, which flow harmoniously, featuring many beautiful and hard to execute inward and outward points and sweepingly sensous curves. Finishing is very well done. With differential finishing applied to different surfaces. 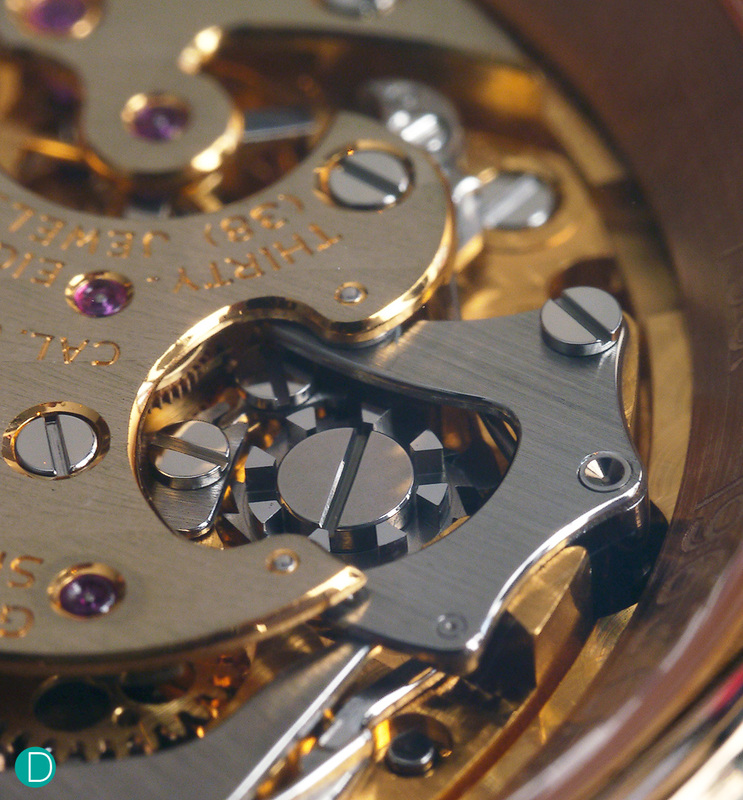 Circular graining is used for the base, straight graining on the chronograph parts, along with a Côtes de Genève as the motif on the bridges. The shape of the bridges are particularly interesting. At the top of the photograph, the bridge seeming looks like a bird about to take flight. Note the complex and very sharp outward and inward points of the bridges. Spectacular. The watch is available in a limited edition of 50 pieces in rose gold case of 42mm in diameter. 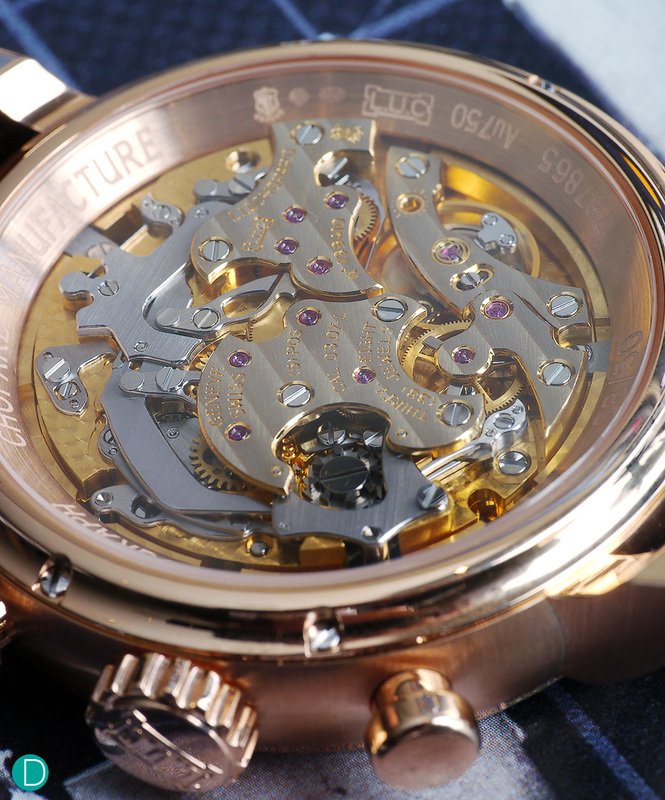 The movement Caliber 03-07 has a power reserve of 60 hours, and beats at 28,800 bph. Detail of the movement showing the column wheel. Whie the column wheel and the levers and springs are set in steel and beautifully polished, we express some criticism, albeit a small nit pick on the simple shape of the levers and springs. A more complex shape, more curves perhaps, would render the movement all the more beautiful. Overall, a triumph on a beautiful hand wound chronograph by Chopard. Along with COSC certification and collecting the Poinçon de Genève hallmark, the LUC 1963 Chronograph is one more reason to respect Chopard as a full fledged manufacture, capable of creating horological marvels. Let us know your thoughts on this watch in the comments section. 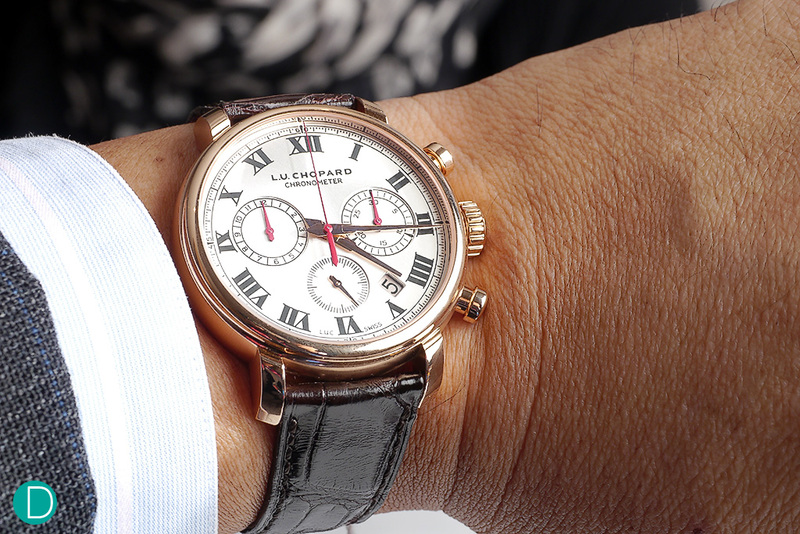 The Chopard LUC 1963 Chronograph on the wrist.